Over the last few years we have done some amazing work for many major events and businesses. We thought we’d like to share some of what we’d done with you. We have produced fibre optic lighting, led lighting and fibre optic displays for many large worldwide events and companies. For more information on other work we have done click here. Below are the jobs we are most proudest off and would like to thank our customers for giving us the opportunity to work with such a variety of topics and in a variety of locations. An interactive replica of the ‘tree of souls’ was created in London’s Hyde Park for the official launch of James Cameron’s Avatar on DVD and Blu Ray. 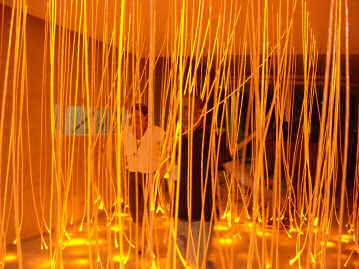 Fibre Optic FX were given the task of recreating the trees strands as seen in the movie. A total of 9000 metres of ‘cracked’ glass’ fibre optic cable was eventually used along with 8 x FX150 light engines in DMX. The light engines in conjunction with motion sensors enabled the colours on the tree to change as people walked through the strands. Additionally, people could connect to the tree via iphones, ipods and other smartphones by downloading an app which allowed them to take full control of the fibre optics. For every person that interacted with the tree 20th Century Fox pledged to plant a real tree as part of their global campaign to plant a million trees. The photos above show actor Stephen Lang (Colonel Miles Quaritch in the movie) interacting with our fibre optic lighting. Over the years we have produced many bespoke Fibre Optic Chandeliers using a wide range of designs. Created using ‘Cracked Glass’ Side Emitting Cable, Chandeliers can be made to virtually any shape or size and are a surefire way to get that ‘wow’ factor. External signage above an Emirates aircraft hanger was backlit with a total 6000mtrs of End Emitting cable and was used in conjunction with 130 x FX150MH Light Engines – which were mounted internally. Each letter is 2.7mtrs tall and four sets in total was illuminated both in English and Arabic. 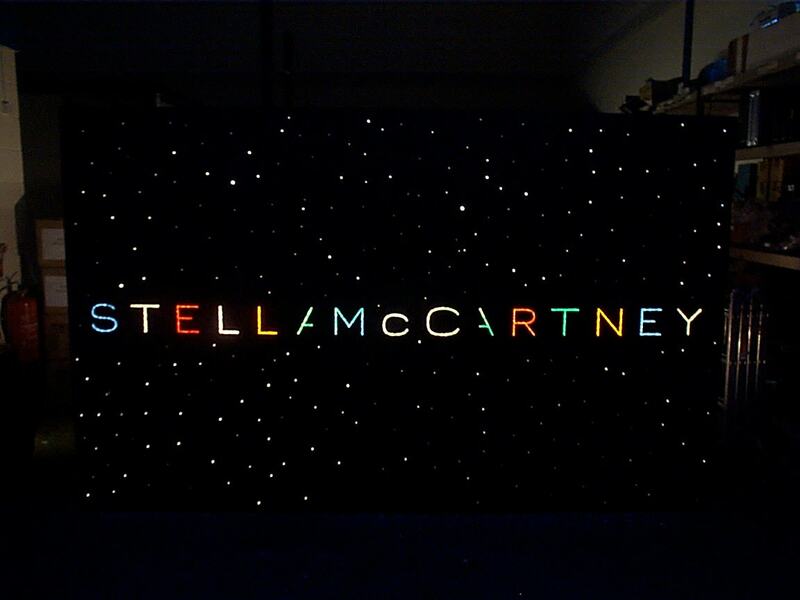 A 3 metre x 2 metre animated and colour changing free standing sign was created for a prestigious event being held by British designer Stella McCartney in Central Paris. In excess of 1000 metres of Optical Fibre was used complete with a ‘Special’ Light Engine built in to the sign casing. This main entrance glass canopy was illuminated using 108 tails of End Emitting Cable complete with bespoke Stainless Steel End Fittings attached to each. Internal mirrors were also fitted to turn the direction of the light 90 degrees. Attached to the back of the canopy were 7 Bespoke 150w Metal Halide Light Engines in Stainless Steel. This impressive new hotel is a flagship for the Radisson Hotel chain and recently the winner of ‘The Lighting Design’ category in the Showcase Build and Design Awards 2008. Fibre Optic Lighting was specified in the bar area which consisted of End Emitting Cable fitted into varying lengths of 10mm thick Acrylic blocks which was then mounted into the joints of a stone wall. Fibre optic lighting can be used to create a twinkling starry night effect on a number of surfaces including ceilings, walls, domes, curtains and carpets. Ready made kits are also available off the shelf. Please contact us for further deatails. This year designer Laurence Llewelyn-Bowen was invited to create a section of the world famous Blackpool Illuminations and Fibre Optic FX were asked to produce an animated colour changing sign based on Lawrences’ original artwork. 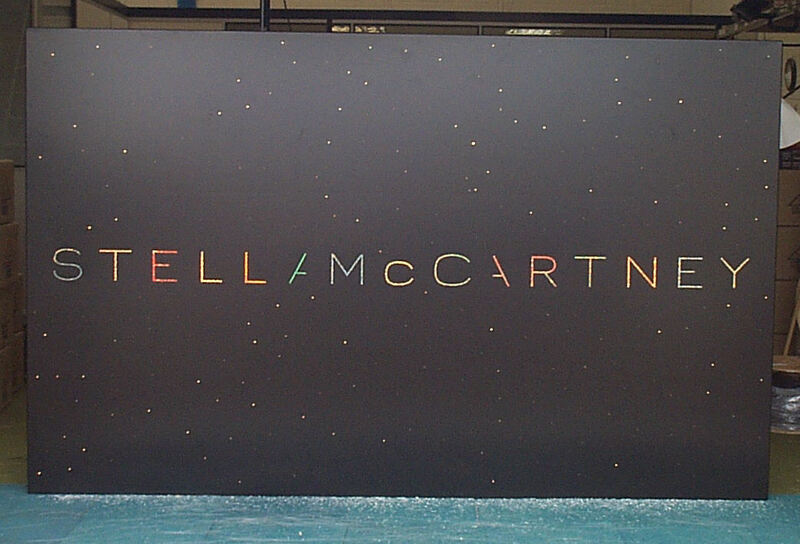 The result was a 4mtr x 1.5mtr oval double sided sign consisting of 2500 End Emitting Fibres. 2 x FX150WP Light Engines were mounted externally. Due to maintenance issues Fenwick Limited decided to replace all their conventional decorative light bulbs with Fibre Optic Lighting. A total of 140 bespoke End Fittings were used in conjuction with our End Emitting Cable all powered by 6 x Metal Halide Light Engines. Designed by the internationally acclaimed artist Mark Jallard this colossal 35-foot by 26 foot sculpture, which has been named ‘The Healing of The Nations’ is an abstract steel and copper circular piece. Hydraulics and End Emitting Fibre Optic cable between two copper skins make all 7 tons of the awe-inspiring sculpture slowly ‘pulse’ or ‘breathe’ creating ever-changing patterns of light. The sculpture has already excited international interest as one of the most innovative pieces of modern sculpture at an English Cathedral.